Just shy of four years after his arrest, the murder case against Rontarus Washington Jr. continues slogging toward trial. Washington has waived his speedy trial rights multiple times over, with his defense team filing extensive pretrial motions. 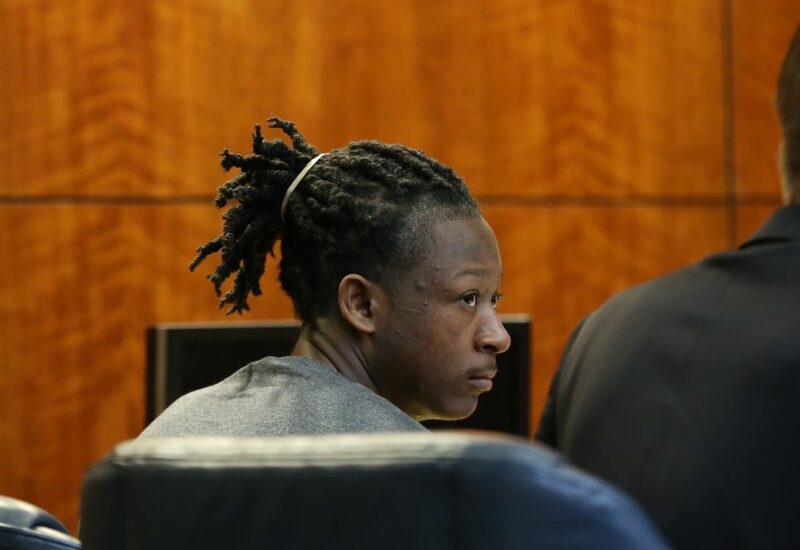 Requests range from arguing that Washington isn’t mentally competent to stand trial, to arguing for permission to present evidence that someone else killed the victim. Those matters continue being taken up — one lengthy hearing at a time — with Douglas County District Court Judge James McCabria. The latest such hearing was Friday. Washington’s jury trial currently is set to begin March 25. Washington was arrested Jan. 15, 2015, in Mississippi and, after extradition proceedings, booked into the Douglas County Jail on March 16, 2015. No other current Douglas County Jail inmate has been in custody as long as Washington. The homicide he’s charged with happened months before that, in November 2014 at Cedarwood Apartments, 1727 W. 24th St.
Justina Altamirano Mosso, 19, was found dead on Nov. 9, 2014, in the bathroom of her estranged husband’s apartment at Cedarwood. Police entered the apartment after Mosso’s cousin and husband both reported her missing. Mosso had been repeatedly stabbed and bludgeoned on the head, apparently with the toilet tank lid found broken near her body, the coroner previously testified. Prosecutors believe Mosso was killed two days before her body was found, on Nov. 7, 2014. Prosecutors contend that the person who killed her was Washington, who lived in a nearby apartment on the same floor. In a formal interview three weeks after the crime, Washington told detectives that he went into the apartment the night of Nov. 7 to look for some change to steal — he’d taken money from there before — and saw a woman stabbed or beaten to death in the bathroom, with blood still pooling around her. Washington told police he then left the apartment without touching anything. Police searched Washington’s apartment and found several articles of clothing that tested positive for blood, including a pair of Nike sandals with a tread-pattern matching bloody footprints at the crime scene. Washington’s fingerprint was discovered on the toilet tank lid. Mosso’s purse and cellphone were missing from the apartment. Police later found her phone on the roof of the building, stuffed into a sock that matched one they found with blood on it in Washington’s apartment. Mosso’s husband, Felipe Cantu Ruiz, told police the two had argued the afternoon of Nov. 7 and that he left his apartment and car keys with her in the Cedarwood parking lot before having a friend drive him to Manhattan, where he was moving. The friend and other witnesses corroborated the couple fighting and Cantu Ruiz leaving. After her husband left, Mosso called a friend and told her that a black man approached her in the parking lot and began to insult her, seeming very angry. Mosso told her friend that the man made her very nervous and that she was afraid. When her friend told Mosso she should leave, Mosso replied that she wanted to get some things from the apartment first. Prosecutors have charged Washington with one count of premeditated first-degree murder, for allegedly killing Mosso on Nov. 7 after 4:01 p.m. — the time Mosso’s call with her friend ended. Washington also is charged with one count of aggravated burglary, a felony, for allegedly entering the apartment with Mosso inside. In their numerous pretrial motions, appointed defense attorneys Angela Keck and Adam Hall have attacked DNA and other forensic testing completed in the case. They’ve sought to present evidence of an alternative perpetrator, Cantu Ruiz, who they say had a motive to kill his estranged wife. They’ve also sought to have Washington’s recorded police interview thrown out of the trial, arguing that it was not given voluntarily. Judge McCabria has approved that request in part, agreeing to suppress the final portion of the interview, recorded after Washington expressed his desire to discontinue speaking with police. On Friday, Hall asked that Washington’s DNA sample and evidence collected when police searched his apartment be thrown out of the trial, because the suppressed part of his interview segued into those items being collected. However, the judge denied the request. Prosecutor C.J. Rieg argued that even without the tail end of Washington’s interview, those items would have been sought and collected. The defense’s pending request to have then-coroner Erik Mitchell barred from testifying at trial will be handled at another hearing, set for Feb. 15. Washington’s attorneys have accused Mitchell of “dishonesty and false statements” based on experts challenging his findings in a recently convicted Douglas County murder case and alleged missteps in a 30-year-old murder case in New York, where he previously worked. A nearly identical request in another murder case Keck is handling got shot down Thursday by a different Douglas County judge. Kay Huff denied Keck’s request to exclude the coroner’s testimony from the upcoming trial of Steven A. Drake III, saying that Mitchell was a qualified expert and could testify. Huff said Mitchell was a proven expert in his field and that Keck’s complaints about him were not relevant to the case at hand.